Renew Your 2017 Commercial Crew License Online for a Chance to Win a Free License! for a Chance to Win a Free License! (Juneau) — The Alaska Department of Fish and Game (ADF&G) announces a promotional give away of ten 2017 commercial crewmember licenses. 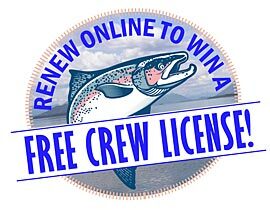 To be eligible, complete your 2017 commercial crew license renewal online, through the Alaska Fish and Game Online Store before October 6, 2017. A valid email, phone, and mailing address must be provided. ADF&G will hold the drawing on Tuesday October 17, 2017. Ten license holders who completed their 2017 license purchase online will receive a refund for the cost of their 2017 commercial crewmember license.